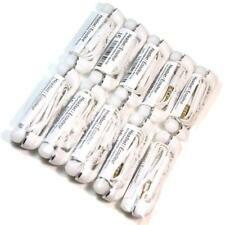 10 Pieces High Quality 3.5mm Audio Jack STEREO HEADSET EARPHONE EARBUD. Ultra High quality & Newest Stylish Comfortable Earbud Design. Build-in Mic to answer calls. COMPATIBLE WITH SAMSUNG GALAXY S2 S3 S4 S5 S6 EDGE S7 S7EDGE. This genuine headset is not only stylish but is built to high specifications. The earpiece has a molded shape for a perfect fit and a plated plug for a perfect audio connection. we were created as a buying group for Gadget enthusiasts who believe in only the highest quality goods. Headphone jack 3.5mm. - Compatible with any audio device with a 3.5mm jack. Genuine Samsung Galaxy S10E S10 S10 S9/S9 S8/S8 Note 8 Note 9 Headset Earphone EO-IG955 - Tuned By. A breakthrough in sound engineering. 1 Pair of Samsung S8 AKG (Harman Kardon) EO-IG955 HEADSET EARPHONE WHITE. 100% GENUINE EARPHONES HEADPHONES HANDSFREE for SAMSUNG GALAXY S6 EDGE S7 EDGE. o Samsung Galaxy S6 Edge , S6 Edge, S6, S5, S4, S3, S2. Samsung Galaxy Headphones Earphones Handsfree with Mic. o Samsung Galaxy S5 Mini, S4 Mini, S3 Mini. GENUINE SAMSUNG HANDSFREE HEADPHONES EARPHONES PHF EHS61ASFBE. This genuine headset is not only stylish but is built to high specifications. The earpiece has a moulded shape for a perfect fit and a plated plug for a perfect audio connection. These In-Ear Headphones from Samsung are designed to bring high quality audio to your ears. Unique Features No more tangle tangled wires. 1 x Samsung Earphones. 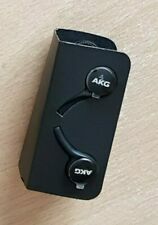 GENUINE SAMSUNG HANDSFREE HEADPHONES HEADSET EHS64AVFBE BLACK. This Original Samsung Handsfree with Mic features a high quality sound whilst still providing great comfort for you to enjoy your music playback. New Headphones For Samsung Galaxy S7 S6 Edge Note 5 4 3 S5 S4 Earphones Handsfree. Samsung Galaxy S6 Edge , S6 Edge, S6, S5, S4, S3, S2. Samsung Galaxy S5 Mini, S4 Mini, S3 Mini. These In-Ear Headphones from Samsung are designed to bring high quality audio to your ears. Practical and comfortable. Long battery life. Ergonomic design and sophisticated: you show off your style with Bluetooth headset. The moulded structure Glossy and gives it a sophisticated look, while the ergonomic design, thin and lightweight (9.2 g) ensures comfort even for prolonged periods. Handsfree Calling. Samsung Galaxy S6. Samsung Galaxy S4. Samsung Galaxy S5. Samsung Galaxy Note. Samsung Galaxy Note 2. Samsung Galaxy Note 3. Samsung Galaxy Note 4. Compatible with: Samsung Galaxy S3,S5, S6, Galaxy Note 2, S3 mini, S4 mini & any other device with a 3.5mm port. 100% Genuine and Original Samsung product. This Original Samsung Hands-free with Mic features a high quality sound whilst still providing great comfort for you to enjoy your music playback. Manufactured to Samsung's high quality build standards the headset is designed for making and receiving voice calls. Exclusively designed for making and receiving voice calls, the EO-MG920 Bluetooth headset is equipped with noise-reduction and echo-cancelling functionality, allowing for clearer voice calls. In-Line Mic with Remote Function. Stereo Sound. Call Answer/End Button. Galaxy S7 Edge/Galaxy S6edge/S6/S7/S5/S4/S3/S2/Note2/Note3/Note4/Note5/ Note Edge Headset Earphone Mic. Excellent heavy bass line, Convenient buttons with Remote. Handsfree with Mic Provides an excellent sound quality. Sophisticated, ergonomic design. Clear voice call quality exclusively designed for making and receiving voice calls, the EO-MG920 Bluetooth headset is equipped with noise-reduction and echo-cancelling functionality, allowing for clearer voice calls. New Genuine Samsung Headphones Earphones Handsfree Compatible with all Samsung devices. These In-Ear Headphones from Samsung are designed to bring high quality audio to your ears. 1 x Extra Spare Ear Buds. Sleek ergonomic design providing more comfort to wear. The new headphones In-Ear stereo earphones make your smartphone music sounds extra amazing.This is ensured by the integrated wind and noise suppression, making this headset ideal for outdoor activities. Designed for Galaxy S6, S6 Edge S7 but compatible with all Samsung Devices. The Samsung EarPods with Remote and Mic have all the performance and comfort plus the new design has excellent sound quality and a heavy bass line. Samsung Galaxy S8, S7, S7 Edge, S6 Edge , S6 Edge, S6, S5, S4, S3, S2. Samsung Galaxy S5 Mini, S4 Mini, S3 Mini. Samsung Galaxy Alpha, Galaxy A3, A5, A7. Samsung Galaxy Note 5, 4, 3, 2 & Edge. Works fine with almost all Samsung devices. 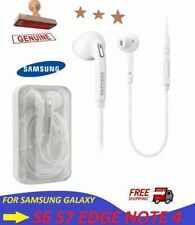 Samsung Earphone Handsfree for Galaxy J1, J2, J3, J5, J7, S3 Genuine Original. - Headphone jack 3.5mm. - Compatible with any audio device with a 3.5mm jack. This is Samsung Handsfree with Mic features a high quality sound whilst still providing great comfort for you to enjoy your music playback. Samsung Galaxy Headphones / Earphone / Handsfree for All Samsung Smartphones. Earphones Headphones Hands-free Samsung Galaxy S6 S7 Edge Note 4/5 MODEL - EG920. These headsets feature 2 speakers in each ear piece, giving your dynamic bass and clear high tones. The flat cable design makes these perfect for traveling. Samsung Galaxy S7 Edge,S7,S6 Edge ,S6 Edge,Galaxy S2, S3, S4, S5, S6,, Note Edge, Galaxy Note 1 and 2, Galaxy Nexus, Galaxy W, Samsung Galaxy Ace, Samsung Galaxy Y, Samsung Galaxy S2 i9100, Galaxy Tab 7.1,10.1 . Enjoy your music with the Samsung EHS64 Stereo Headset. OEM Samsung EHS-64 Galaxy S Premium Headset is lightweight and comfortable. The white colour adds style and the lightweight design. Comfortable soft ear gels help isolate your ears and block out external noise while listening to music. Samsung Galaxy S7 S7 EDGE S6 S6 Edge Note 5 4 3 S5 S4 Headphones Earphones Handsfree. Samsung Galaxy S6 Edge , S6 Edge, S6, S5, S4, S3, S2. Samsung Galaxy S5 Mini, S4 Mini, S3 Mini. 1 x Earphones Case. Samsung Bluetooth hands free headset with single in-ear bud. Compatible with Apple / Android Bluetooth phones. Bluetooth Version: v2.1 EDR. Active Bluetooth pairing. Profile: HFP1.1, HSP1.5. 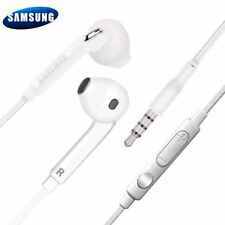 Genuine Samsung S3 S4 S5 S6 Handsfree Headphones Earphones Earbud-. - Headphone jack 3.5mm. Samsung Galaxy S7, S6, S5, S4, S3, S2. Samsung Galaxy S5 Mini, S4 Mini, S3 Mini. Samsung Galaxy Note 5, 4, 3, 2 & Edge. Samsung Handsfree Headphones Earphones Earbud with Mic. The Earbuds with Remote and Mic have all the performance and comfort plus has excellent sound quality. These work with any Samsung device or any device with a 3.5mm port. New Genuine Samsung Galaxy S6 S7 Edge Note 5 4 3 S5 S4 Headphones Earphones Handsfree. Samsung Galaxy S6 Edge , S6 Edge, S6, S5, S4, S3, S2. Samsung Galaxy S5 Mini, S4 Mini, S3 Mini. These In-Ear Headphones from Samsung are designed to bring high quality audio to your ears. Practical and comfortable. Samsung EO-MG920 Original, Universal Bluetooth Headset. Long battery life. Ergonomic design and sophisticated: you show off your style with Bluetooth headset. The moulded structure Glossy and gives it a sophisticated look, while the ergonomic design, thin and lightweight (9.2 g) ensures comfort even for prolonged periods. Official Samsung Handsfree Headset In-Ear Earphones Earbud With Mic – Black. Headphones & Earphones (10). The EO-EG920BB White uses the Dual Speaker system that optimises your acoustic sensations. Slots and holes allow venting to minimise the air pressure and provide a balanced sound. S4, S5, S6, S7 MINI EDGE BLACK. SAMSUNG STEREO EARPHONE HANDSFREE GALAXY. Genuine Samsung Earphones. Built-in Mic, Answer/End call button. 100% Genuine Samsung EG900Earphone. Production Type: Samsung genuine Eg900BB headphone/earphone. Samsung Handsfree Headphones Headset. This Original Samsung Hands-free with Mic features a high quality sound whilst still providing great comfort for you to enjoy your music playback.